for Help With Your Shredding Needs! Whether you have paper documents or backup tapes and hard drives, we destroy them responsibly and in accordance with state and federal regulations. Don't let your confidential information fall into the wrong hands. Contact us by phone or complete the form on this page to take advantage of our secure shredding service today! How Often Do You Shred My Information? We shred your documents and data as often as your business requires. We offer both on-demand purges and regularly scheduled shredding services to fit your needs. Whether you have boxes of outdated files or need secure, locked consoles where you can deposit obsolete paperwork, DeVries has you covered. We even offer convenient drop off shredding at our plant for reliable and secure destruction. It's easy! Simply call us at 866-433-4691 for a free consultation or complete the form on this page. We'll assess your destruction needs and implement a shredding schedule that makes sense for your business. Whether you need your information shredded one time or require regularly scheduled service, our background-screened, uniformed and badged shredding technicians handle the entire destruction process. Your information is destroyed with NAID AAA Certified processes and you are issued a Certificate of Destruction at the completion of your shredding project. 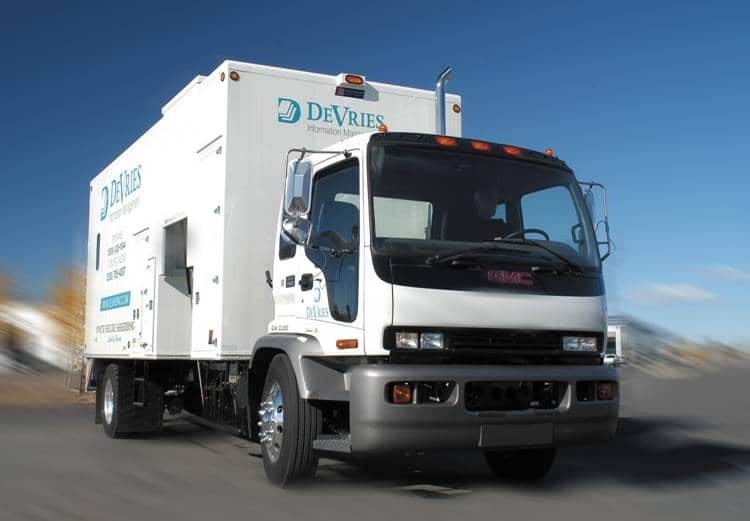 What makes DeVries' Shredding Services Different? As your neighbor, earning your trust isn't something we take for granted. We value your business and understand that protecting your information has a positive effect on your business and the entire community. To learn more about our secure shredding services, please contact us by phone or complete the form on this page.